A movie like Real Steel becomes believable because the actors are really saying their lines to a larger than life robot rather than a tennis ball on a stick. This was especially important for the two main actors, Hugh Jackman and Dakota Goyo, who play Charlie and Max Kenton. The actual robots served as great models for the CGI team as well. “These were made…from sketches and designs; we modeled all of these parts in the computer. And I think on the average there’s about three hundred and fifty parts to every one of these robots. And when these parts were modeled, you had ‘em modeled every bit and piece in detail, and they all had to fit together,” John Rosengrant shared with us. At the presentation, we were able to see two of the full scale robots used in Real Steel, Noisy Boy and Atom. “One of ‘em’s not here today. He’s…out on tour elsewhere. But it’s Ambush, the big blue one,” Rosengrant said. Ambush is Charlie Kenton’s first robot that is destroyed by a bull at a county fair. A team of around 70 was responsible for creating the robots. “The first probably five weeks was all computer modeling and these parts set up for rapid prototyping. And then when those came back, each one had to get finished off by hand and molded,” Rosengrant told us. We also got the opportunity to talk with Erik Nash, who was the visual effects supervisor for Real Steel, and previously worked on movies such as Titanic and Pirates of the Caribbean: At World’s End. 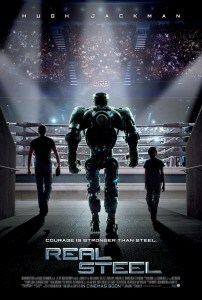 The technology used in Avatar was extremely beneficial to the Real Steel CGI team. “It all starts with motion capture. So these are our, our boxing performers. These are the guys that Sugar Ray worked with. And they’re wearing these motion caption suits that have all these little gray markers on ‘em. And those markers are seen by about sixty cameras that cir-, that, uh, and circle this ring. Those cameras feed into a computer, which allows us to take that motion and apply it to digital versions of the robots. So this video game quality render is the first iteration in our process.And you see Shawn here in the bottom corner holding our virtual camera tool. And what that allows him to do it is once the, the boxing, um, motion is captured, he can then photograph the sequence in, in the virtual realm in its entirety before we, uh, even go to Detroit to shoot the movie. So this, this becomes our template for the sequence months before actually starting photography, so what we know what the shots are, how long the shots are, what happens in every shot.” Nash walked us through the steps on a computer screen, explaining each detail along the way. I enjoyed their presentation, and hope that they film something similar to what we saw for the DVD and Blu-ray release of Real Steel. Is this something you would enjoy seeing, too?